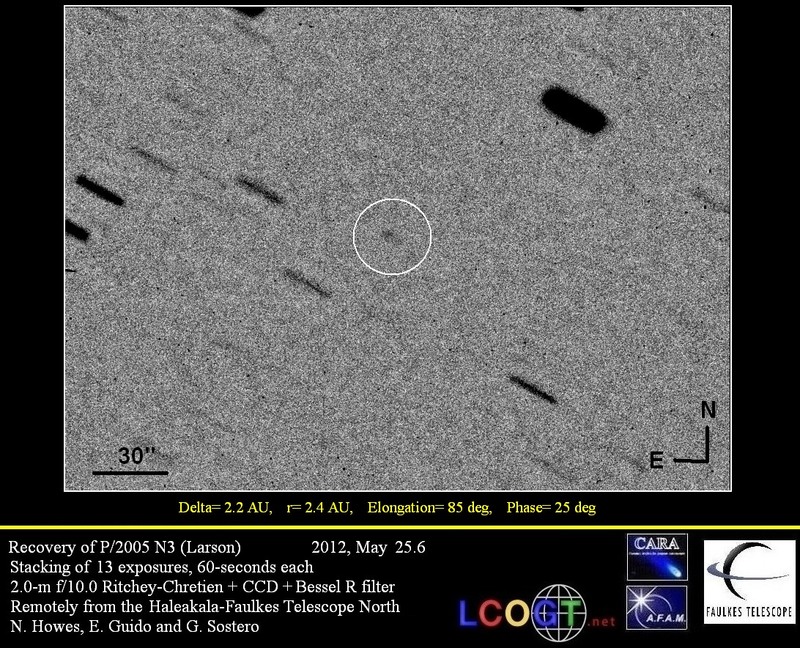 IAU Circular nr.8968, issued on 2008, August 28th, announces the discovery by Gordon Garradd of a new comet, named C/2008 Q3 (GARRADD). It was picked-up in the southern constellation of Phoenix, through the 0.5-m Uppsala Schmidt telescope, on 2008 Aug 27.6. The discoverer reported for it the detection of a 10" coma, more prominent toward north. After its posting in the NEO-CP page, A. C. Gilmore and P. M. Kilmartin confirmed indipendently the cometary nature of this object (small coma about 6 arcsec in diameter with no tail). However the S/N in the stacks was not high enough to be sure about the reality of this details, and the sky conditions, initially very good, were rapidly deteriorating. So we lost the opportunity to perform during the same night additional follow-up of this target, in order to make sure about its cometary nature. Then we decided to get back into it the next nigth, but, meanwhile, its cometary nature was already published thanks to the IAU Circular nr.8968. Preliminary orbital elements, published on M.P.E.C. 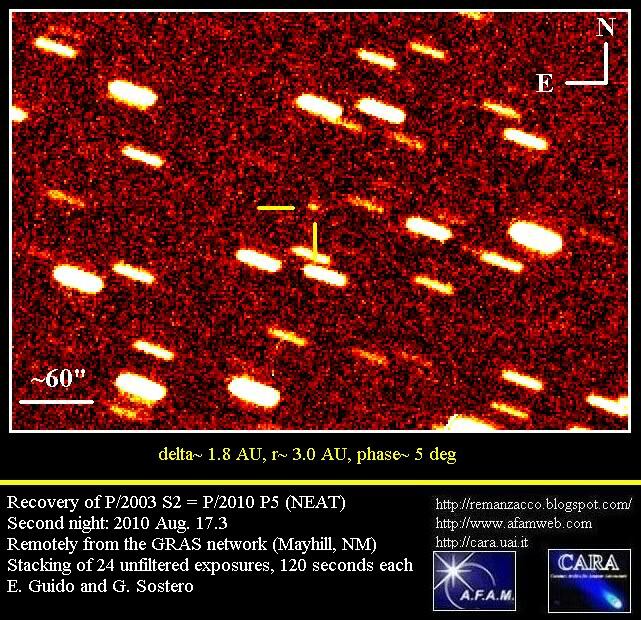 2008-Q52 (http://tinyurl.com/6ozaso), provide for this comet an eccentricity of e=1, and an inclination of i= 140 deg, that makes it moving along a retrograde orbit. Perihelion, at q= 2.5 AU will be reached in July 2009 (maximum magnitude is expected to be about 15). This comet will mostly be a southern object. 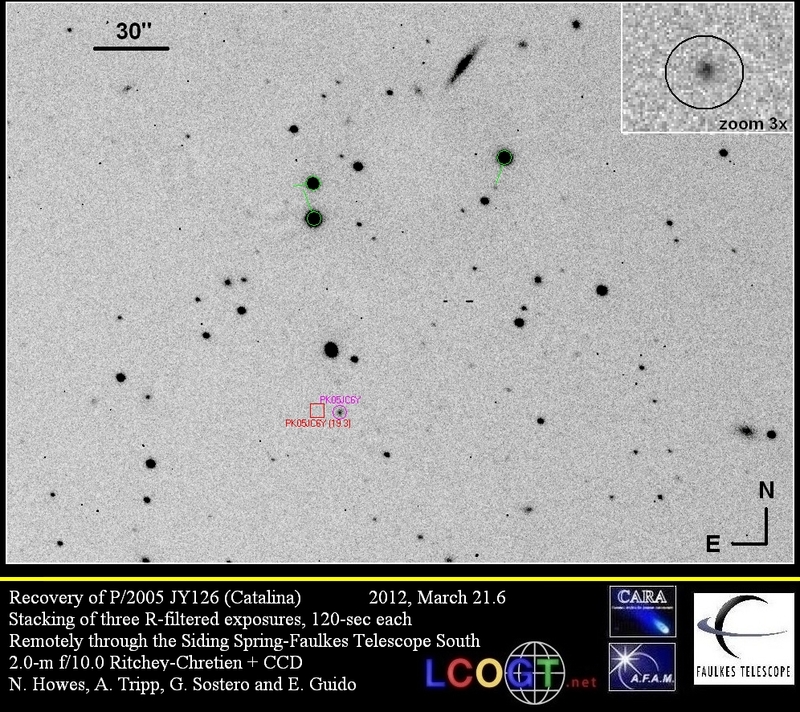 During the same oberving session, we also performed some follow-up of the new discovered Aten-type minor planet 2008 QV11 (http://tinyurl.com/57tq56), a "chunk of rock", about 200-m in diameter, that was passing about 0.2 AU from Earth. IAU Circular nr.8966, issued on 2008, August 20, announces the discovery by Stanislav Maticic of a new comet, named C/2008 Q1 (MATICIC). The comet was discovered in the course of the Comet and Asteroid Search Program at Crni Vrh Observatory and reported as "a moving object of stellar appearance" about magnitude 18. 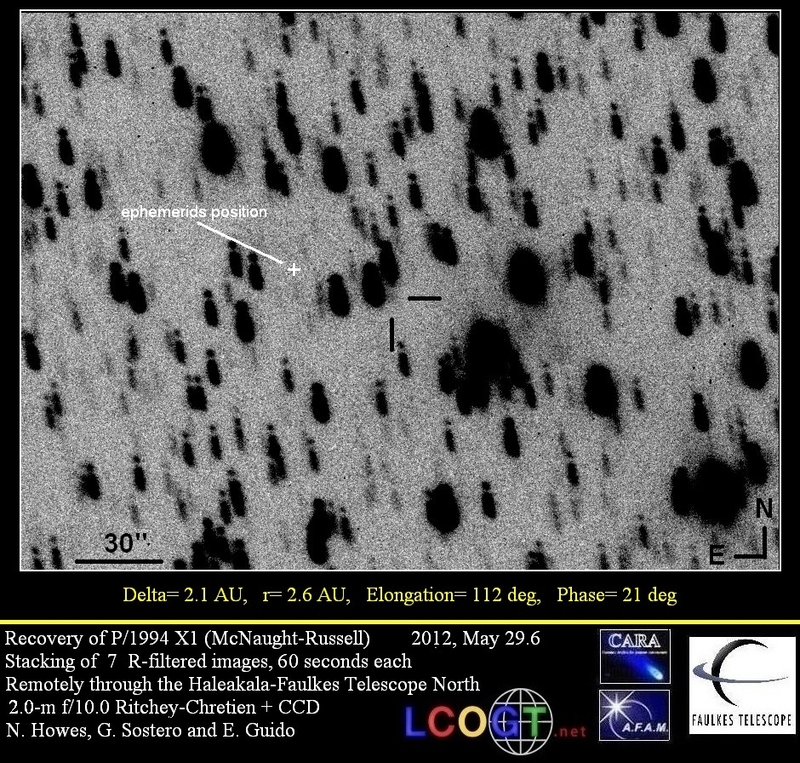 After posting on the Minor Planet Center's 'NEOCP' webpage (designation 88I0001), several observers found this object to show cometary appearance. however due to the fact that the S/N of the image was not so high, we decided to collect some further observations, in order to discriminate about its possible cometary nature. Then we observed it again from MPC#473 (Remanzacco) on Aug. 20.8, through a 0.45-m f/4.4 Newtonian reflector + CCD. This time the cometary nature of the object was clear: co-adding of 16 unfiltered exposures, 60 seconds each, showed that this object had a coma, with a diameter of about 10 arcsec, and a broad tail nearly 15 arcsec toward PA 122deg. Preliminary orbital elements published by the Minor Planet Center in M.P.E.C. 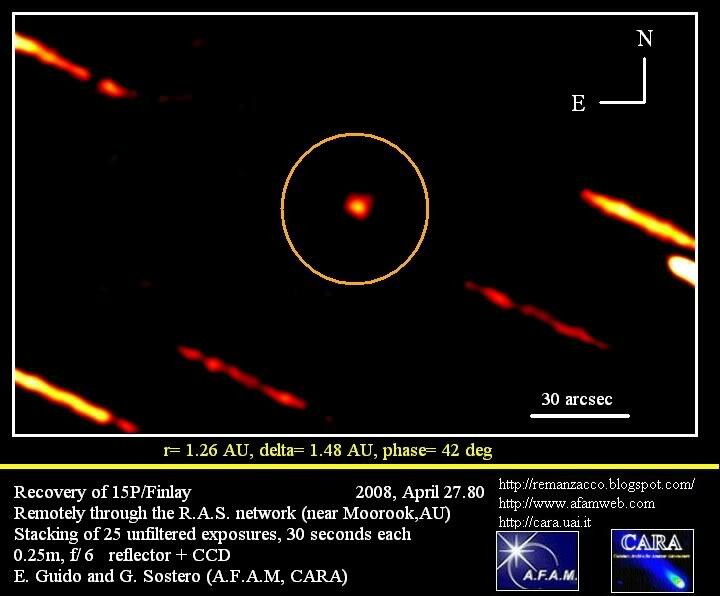 2008-Q30 (http://tinyurl.com/5dj5lf) assumes that this object moves along a parabolic orbit (i= 119 deg, q= 2.9 AU); perihelion will be reached at the end of December 2008. According the current ephemerids, this comet will reach its maximum brightness next April (m1~ 17.0). 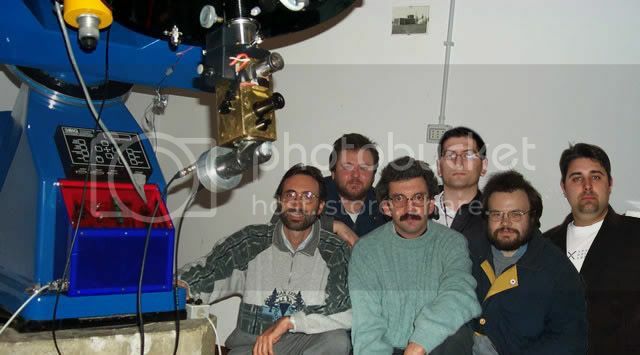 Congratulations to Stanislav Maticic and to all the team at Crni Vrh Observatory. 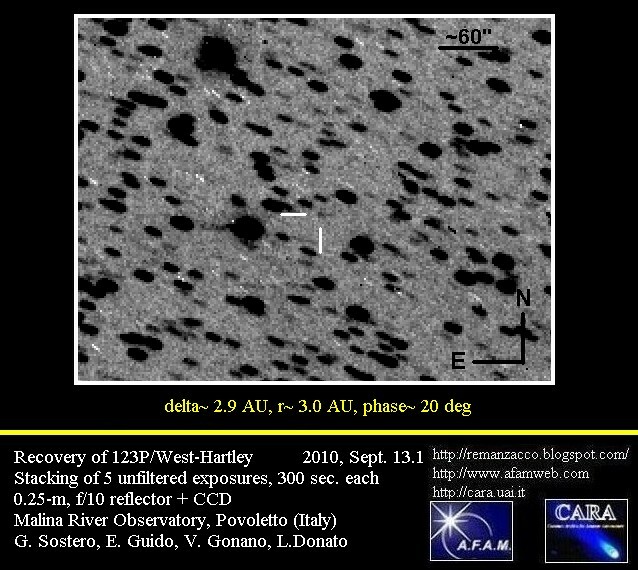 Prompted by an alert of Gustavo Muler about a possible outburst of 199P/Shoemaker, we perfomed some follow-up of this comet: we can confirm his initial observation of 2008, Aug. 3.9, that this comet is experiencing a bright phase. Co-adding of 30 unfiltered exposures, 60 seconds each, obtained on 2008, August 04.16 through a 0.25m, f/3.4 reflector + CCD (near Mayhill, NM) reveals the comet as an obvious featureless star-like object of magnitude 14.7N. Image enhancement techniques show also the presence of a fain external coma, about 25 arcsec in diameter. The total magnitude m1 calculated for an aperture of 25 arcsec in diameter is about 14.6; the afrho parameter (proxy of the dust abundance within the coma) has been found to be about 800 +/- 100 cm (however it must be said that for an outbursting comet, the afrho characterization is not very meaningful because we are lacking a steady state coma behaviour). 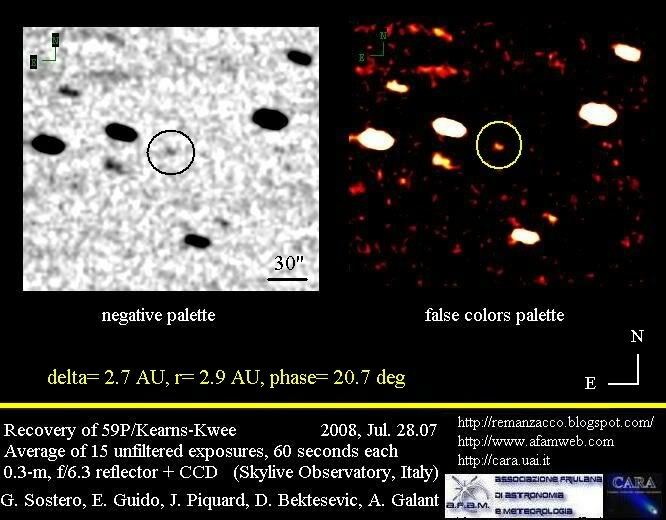 According to Minor Planet Center "dates of last observation of comets" website, 199P was last observed by Gustavo Muler (MPC #J47) at magnitude 17.9N on 14.92 July 2008. This object was insert in the NEO-CP on 2008, July 28.6 with the ID code 8O56129. We performed some follow up from different sites: initially we imaged it on Jul. 28.9 with the Skylive-4 (0.3-m, f/6.3 reflector + CCD) scope (near Catania, Italy, MPC#B40). Since the sky conditions were not so good, we were unable to define for sure its nature (asteroid or comet?) 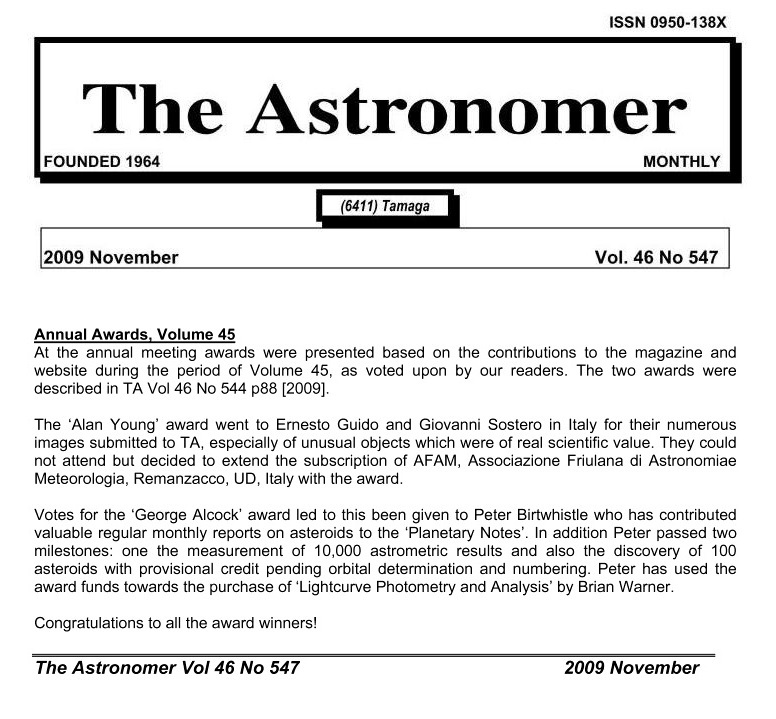 so we decided to submit to the MPC only a couple of lines about its astrometric positions. 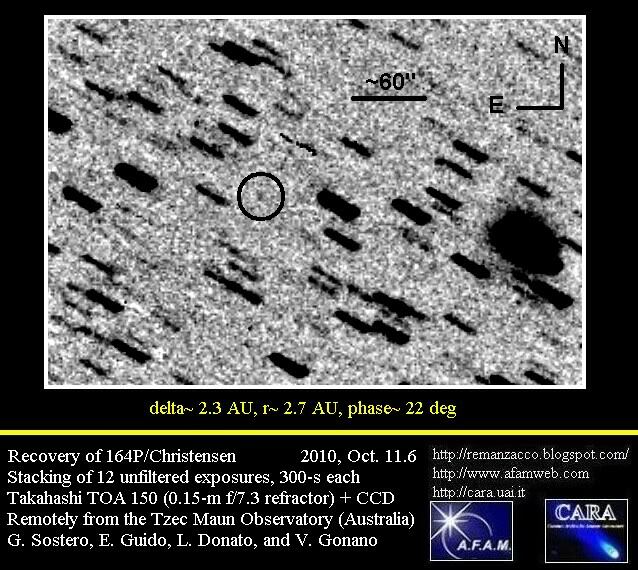 Afterward we picked it up on 29.1 from the private observatory of one of us (Gustavo Muler, Lanzarote, Spain, MPC#J47): here the stackings obtained through a 0.3-m schmidt-cassegrain + CCD clearly shown the presence of a small compact coma about 12 arcsec in diameter, and a short tail, nearly 30 arcsec long, toward PA 255; the total magnitude of this comet has been measured at 17.7. Then we performed some further follow-up on July 29.3 by means of a 0.25-m, f/3.3 reflector + CCD of the the RAS network (near Mayhill, NM, MPC#H06): here Ernesto confirmed the presence of a small tail about 25 arcsec long toward South-West. Furthermore we observed it on on Jul. 30.6 with the Skylive-5 (0.3-m, reflector + CCD) scope (Grove Creek observatory, near Sidney, Australia, MPC#E16), obtaining additional astrometry. 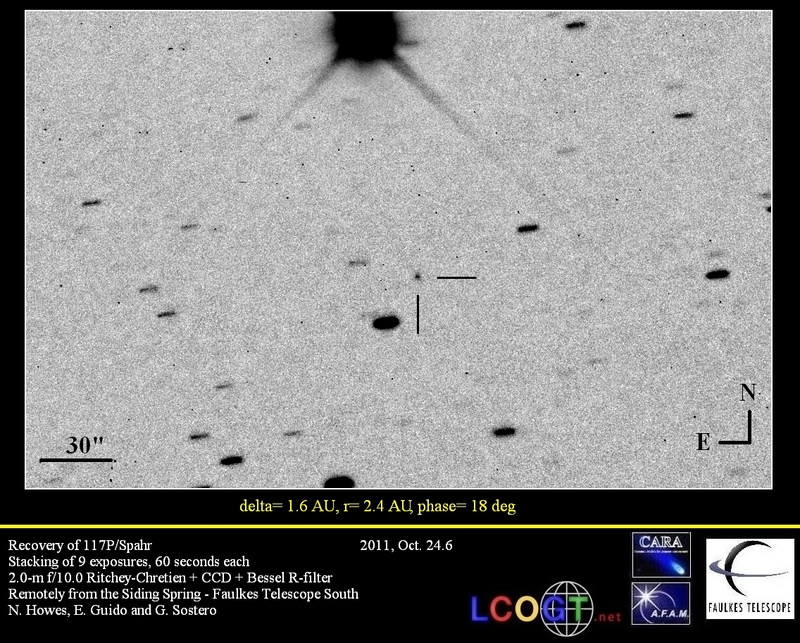 According to the currently available orbital elements published by the Minor Planet Center (http://tinyurl.com/6depww), comet C/2008 O2 moves along an parabolic orbit. If the current (preliminary) orbital solution will be confirmed, this new comet McNaught will reach perihelion in 2009 November; at maximum magnitude it is expected to be a pretty binocular object, well placed for northern observers.